Senior White House adviser Kellyanne Conway spoke out on the trials of her role within the Trump administration on last weekend, saying her job would be "more difficult" if not for her religious beliefs. Conway has served as a spokeswoman for President Trump since managing his successful 2016 campaign, and has continued to act as such in her current White House role. The former CNN political analyst has in the past described criticism of her as "vicious" and "venomous," and discussed that when addressing a crowd of 900 conservative Christians at the Family Leadership Summit in Iowa last Saturday. "It is just our job to focus on the news and cut out the noise," Conway said. "That is something I try to do very often. But you know, if I wasn't a person of faith, I think it would be a more difficult job." Conway added that her Christian faith helps her to "stay grounded." Conway also spoke on what it means to be a woman in her White House role, saying much of the criticism against her is "gender based." "It is unbelievable how if I just say something on a television program or the president said something, the reaction is so disconnected from what was just said," Conway said. "If you want to disagree on policy ... then say that, disagree that way. That is what America is. But so much of the criticism of me is gender-based. So much of it is gender based. ... I pray for the country and I pray for my critics." Conway's slamming criticism of her as a woman comes after the 50-year-old bashed the idea of feminism during a Q&A session at the Conservative Political Action Conference back in February. "I was raised to be a strong, independent woman, without anyone saying the word 'feminist' or having a political conversation," Conway then said -- a statement that was met with raucous audience applause. Conway also said back in February that she thinks women too often feel sorry for themselves, and that there is a "presumptive negativity" around how women are treated and viewed in society. Now, though, Conway is addressing criticism of herself within the lens of her gender. "If they are going to criticize policy, that's terrific. 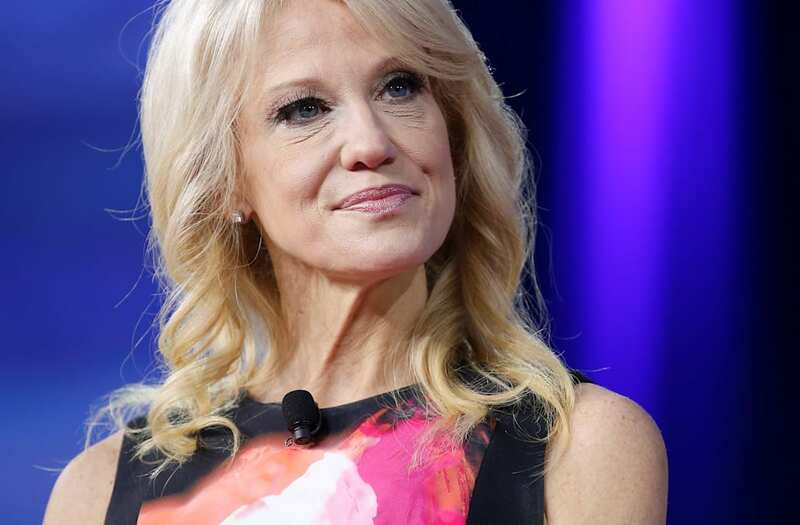 But criticizing how I look or what I wear or how I speak is really remarkable and totally undercuts modern feminism, that they are for women," Conway added. "I think a lot of it turned when I showed up at the March for Life and I was overtly a pro-life counselor to the president. A lot of the coverage changed then." After graduating law school from George Washington University, Conway worked as an assistant at a firm headed by Richard Wirthlin, who was Ronald Reagan's pollster and strategist. She later came to work with Newt Gingrich in the 1990s. In '95, at 28, Conway founded The Polling Company, of which she is still CEO. As New York Magazine reported, Conway quickly recognized "there was money to be made" in advising private corporations and politicians on how women vote — the population her company focused on. During the '90s, Conway began making regular television appearances along with other political commentators, such as Ann Coulter. She was also a regular on Bill Maher’s show "Politically Incorrect." In 2001, Conway married George T. Conway III. They have since had four children. George T. Conway III is a lawyer who graduated from Yale Law School in 1987, and played a part in the impeachment of President Clinton, as a member of the team representing Paula Jones. Conway has worked with high-profile clients including the National Football League and Philip Morris. He currently works for what's considered one of the country's "most grueling law firms," Wachtell, Lipton, Rosen & Katz in New York City. In 2001 the newly married couple bought a condo in Trump World Tower, where they lived for seven years. It was during that time that Conway met Donald Trump. "I sat on the condo board, and he’s very involved in his condos," she told The New Yorker. In 2004, Conway co-authored the book "What Women Really Want" with democratic pollster Celinda Lake. By 2008 the Conways had moved to what Forbes has called "America’s most expensive Zip Code," Alpine, New Jersey. The family joined the Alpine Country Club in Demarest, New Jersey. There annual memberships can cost up to $75,000, plus $25,000 a year in dues. Later, Conway worked with Newt Gringrich again during his unsuccessful 2012 presidential run. A few years after, the Polling Company began working with various republican candidates including Ben Carson and Ted Cruz starting in 2015. While the super PAC behind Carson's campaign paid the Polling Company $65,000, the Polling Company later worked with Cruz's three PACs. After Cruz dropped out, one of his super PACs changed its name and backed Trump — continuing to work with The Polling Company. By October 2016, Conway's firm had made $1.9 million from the 2016 election. In July Conway joined Trump's campaign team as an advisor, and later officially became campaign manager in August — at this time, her firm was still receiving payments from Trump's PAC. Today, much of Conway's income comes from The Polling Company — somewhere between $1-5 million, and the couple has earned thousands in dividends from stocks, and one Citibank account has been reported as being valued at between $500,000 and $1 million. At the start of President Trump's term in office, the Conways reported assets worth between $10 million and $39.3 million, and the couple recently moved into a $8 million dollar DC-area home.